The last time a coach was ejected within the first 2 minutes of a game was Washington’s Flip Saunders on Jan. 2, 2012, at Boston, according to research by the Elias Sports Bureau. Saunders was ejected 1:46 into the game. 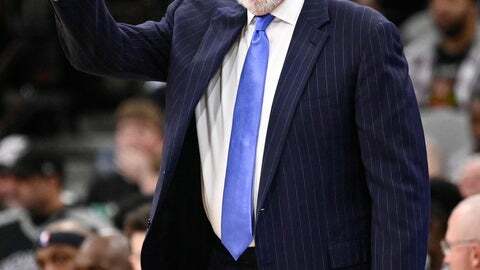 Taking over on the bench for Popovich was assistant coach Ettore Messina as the Spurs were beaten 113-85 by the Nuggets. Following the game, Popovich didn’t have much to say. “You’ll have to ask the officials,” he said. As he made his way down the hall, Popovich joined the scrum where Nuggets coach Michael Malone was conducting his postgame interviews. The exchange between the coaches was nearly as long as Popovich’s appearance in the contest. Then, Popovich headed for the exit.